If not for a six-minute letdown late in the first half Tuesday at the Mack Chase Athletic Complex, the Lady Bulldog soccer team might have limited Class 5A nemesis Carlsbad to just a pair of goals. A loss would still have been a loss, but that’s never Artesia’s focus when competing against the Cavegirls, head coach Tim Trentham says. Versus higher-classification opponents like Carlsbad, Hobbs and Clovis, it’s all about the team proving something to itself. And for the most part, Tuesday, Trentham feels they did. For the majority of the first half Tuesday, the Lady Bulldogs did a solid job of holding the Cavegirls at bay. Carlsbad was finally able to post its first goal at the 23:08 mark. With 6:16 to go in the half, however, the Cavegirls struck again, and unfortunately, the floodgates opened from there. Carlsbad would log two more goals in the final moments leading up to the break, in the 35th and 38th minutes respectively. Carlsbad was able to round out the final just under two minutes into the second half on a rough goal that saw the initial shot blocked by Artesia keeper Kamiley Marquez. With no one there to clear it, however, Marquez was left scrambling to reach it, and the Cavegirls were able to send in the rebound. From there, however, the Lady ‘Dogs stepped up their aggressiveness to hold Carlsbad at bay. “I thought we did great in the second half,” Trentham said. “They had that early goal, but the rest of the half, I was proud of the way we played. I thought we did a lot better. We were being physical, and we played like we should’ve been playing in the first half. 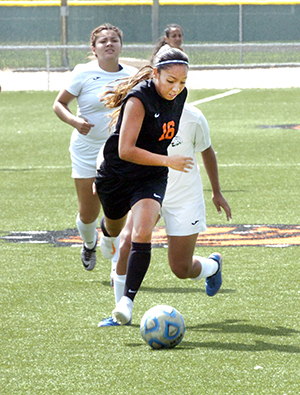 The Artesia girls (6-5) will now prepare to spend next week on the road, heading first to Roswell High at 6 p.m. Tuesday before travelling to Ruidoso Saturday, Sept. 29, for 1 a p.m. third meeting with the Lady Warriors. The Lady Coyotes are currently 7-3-1 on the year with a range of scores that are a bit difficult to assess, such as a 2-2 tie with Goddard Sept. 6, followed by a 9-3 loss to the Lady Rockets Saturday. “We’re doing a lot of the right things right now,” Trentham said. “We have a brand-new defense from last year. Only one person returned there, and what we were doing to start the year is not what we’re doing now, so we’re getting better, and I think we’re going to see that playing better competition like Carlsbad is going to have strengthened us more in that area.